It is unrealistic to assume that certified athletic trainers, school nurses, and especially parents know what to do for a dental or sports related injury. While your dentist is always the first line of defense, dental injuries can have improved outcomes if the public is aware of first-aid measures. There are some simple rules to follow and it is helpful to think in terms of three categories of need when dental injuries occur: Immediate — within minutes, Urgent — within 6 hours and Less Urgent — within 12 hours. Using this as a basis we have included a “Field-Side Guide” for management of dental injuries for non-professionals, members of the public at large. What about more involved injuries? It's quite shocking when injury occurs and teeth are “luxated” – dislodged, “avulsed” – knocked out or severely fractured exposing the pulp (nerve). 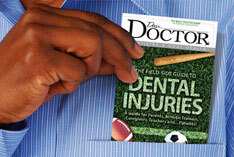 We have also included a section on the treatment of specific injuries to teeth. This area includes root canal or endodontic treatment of injuries affecting the central pulp chamber of teeth, which contains vital living tissue (including the nerve). A review is provided to show how appropriate and timely treatment can provide comfort, healing and restoration of damaged teeth. Importantly, this includes the circumstances of the injury, the age of the injured party and stage of development of the injured tooth or teeth — all of which help determine the long-term outlook and planning for the future. Low Velocity Non-Contact Sports — Refers to golf, nordic skiing, weight lifting, running, swimming and others where the athletes perform individually at a reasonable speed without contact with others. The risk of dental injury is low. High Velocity Non-Contact Sports — When “non-contact” athletes move at high rates of speed, accidents can occur. Examples are bicycling, motocross, skateboarding, skiing and snowboarding. These accidents can be some of the most complicated and severe. Contact Sports — Characterized by frequent body to body, or body to equipment (ball) contact. Contact is incidental to the game, not a requirement. Examples of this are basketball, soccer, lacrosse, baseball, and softball. Injuries such as soccer and basketball have been reported at 25% of all athletes surveyed. Collision Sports — Contact is an intended and critical part of the game. Examples are American football, ice hockey, rugby and boxing. Without protection, they are most likely to result in oral-facial injuries, making the case for the use of protective devices, which show the best success when used. When it comes to sports-related dental injuries, it's all about prevention — and that revolves largely around protective equipment. To prevent dental injuries, there are two essential pieces of equipment — headgear and mouthguards, both of which help distribute the forces of impact, thereby reducing the risk of severe injury. Mouthguards are by far the best equipment for protecting both the teeth and mouth in contact sports — when they are used. For many sports, like football, it's an obvious need. As a rule of thumb, mouthguards should be used when the sport involves a ball, stick, puck, or physical contact with another player. And, they should be used not only during games or events, but also during practice. The market has recently seen the introduction of so-called high performance mouthpieces or performance enhancing mouth wear. While research supporting their prowess is ongoing and their price is high, evidence to support their effectiveness is scant.